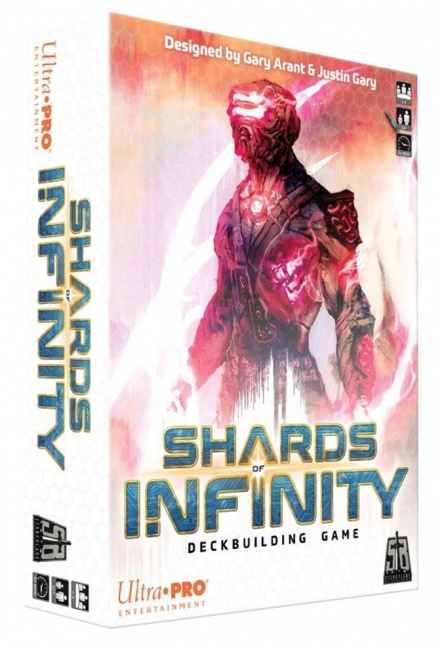 Ultra Pro Entertainment has announced Stone Blade Entertainment's new deck building game Shards of Infinity, co-designed by Ascension designer Justin Gary. Shards of Infinity is designed by Gary Arant and Justin Gary. Gary co-designed the popular Ascension: Deckbuilding Game with John Fiorillo (see �'Ascension: Year Four Collector's Edition'�) and Arant has design credits on two recent Ascension sets. Shards of Infinity takes the core deck-building concept in a new direction, streamlining play and strategy. Players in this future dystopia are vying to accumulate shards of The Infinity Engine and master them. Instead of defeating monsters to earn points toward victory, players must either gather 30 Mastery points to use the ultimate power, or defeat all opponents. The box includes 128 cards, four character dials, and a rulebook. The game is for 2 � 4 players, ages 10 and up, and plays in 30 minutes.